The GROHE Essence shower mixers and the GROHE Sena hand showers draw attention effectively to the minimalistic shower area. 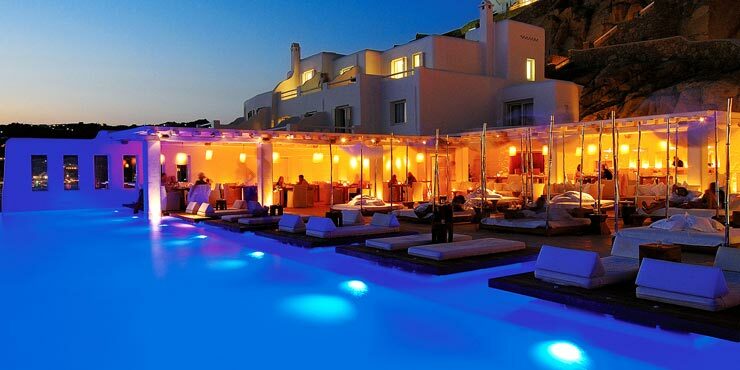 Cavo Tagoo Hotel is a multi award-winning boutique hotel, nested in a converted quarry in Mykonos, ingeniously engineered into the cliff-side. The hotel provides a contemporary interpretation of vernacular architecture: economy of space, radical simplicity, and organic forms, while achieving a beautiful balance of comfort, luxury, and style. The high aesthetic requirements of the minimalistic design are also implemented in the bathrooms. GROHE Atrio and GROHE Essence faucets for basins, showers and bidets control the perfect flow of water at all water outlets, while GROHE Tempesta and GROHE Sena hand showers provide an enjoyable shower experience in a stylish environment.